For those seeking a strong global financial region with exciting opportunities for growth – both actual and potential – Asia Pacific (APAC) remains the one to beat. Yet despite the continued promise of new infrastructure, clients, and regulatory drivers, historically Asian financial services have been notably slow in one key area: namely the uptake of market data solutions. However, over the last year the rate of growth has increased as investment firms look for global expansion and Asian exchanges seek to expand their liquidity sources and compete to be the one-stop shop within the region. And as demand for market data increases, the willingness of industry participants in the region to spend on market data solutions instead of attempting to build in-house is notably on the rise. So what are the key drivers behind this change and just how much growth should we expect in the coming year for market data services in APAC countries? According to the most recent Global Market Data Demand survey results from Burton-Taylor International Consulting, Asia continued its positive performance in 2015 with spending on market data services rising by 7.84% - by far the strongest expected rise of any region. For 2017, this trend is forecast to continue apace with the Asia region, excluding Japan, expected to leapfrog India and become the second-fastest growing financial area. In fact, fewer than 5% of overall respondents forecast negative growth in Asia (ex-Japan) for the coming year. In terms of market segment demand, Burton-Taylor also found that the forecast rise in spending among risk managers and buy-side functions in 2017 was expected to be greater than that of the overall market. In addition, I would argue that actual demand from this region is likely to be even larger than these forecasts, which take into account only consolidated feeds and not direct feeds. We’re finding that APAC firms increasingly want direct connectivity, through feed handlers, so they can access market data from source, for example directly from the exchanges. So whilst the spend on market data is indeed shifting, if we incorporate the rising popularity of direct feeds as well, the potential for growth is even greater than initially thought. Additionally, as the electronification trend continues on trading floors across the region, this is going to drive further demand for direct market access and direct feed handlers. We are also seeing an increase in trading applications, both buy-and sell-side, moving towards becoming platforms-as-a-service in place of the region’s traditional preference for enterprise platforms. This is more of an established trend in Europe and North America but one that now certainly seems to be replicating in the APAC region, given the wider geographical fragmentation of markets and services. In the coming year, we expect to see to a number of new regulatory requirements take effect in, or indirectly impact, the region, which will provide further opportunities for service providers to offer solutions to ease the cost and operational burden these can introduce. As a result, APAC firms are reassessing their previous preference to build over buy – or Do It Yourself (DIY) solutions as they’ve come to be known. The benefits of using third-party, specialist providers, as compared to the potential risk of building a DIY in-house solution, are becoming increasingly self-evident and I expect this paradigm shift to continue into the coming months and years. Whilst these sourcing and regulatory trends will sound familiar and similar to the trends witnessed in other regions, the impact within the APAC region is exaggerated by the geographical, cultural and regulatory fragmentation, making it harder for firms opting to do it themselves to find the right economies of scale. To be able to offer market data solutions that can address these differences, even as they are constantly changing, requires firms to adopt a uniquely agile approach. 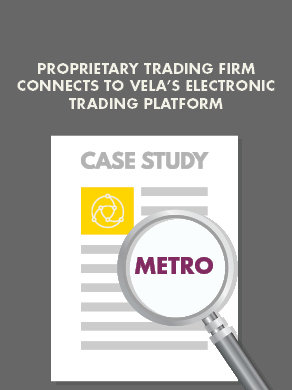 By having the ability to fail fast and tackle complex issues afresh, Vela is able to offer solutions that are consistently tailored to our client’s needs. It is this level of flexibility which ensures that we are always one step ahead of the latest requirements whilst also being able to offer the highly accurate feeds and sophisticated solutions which this market increasingly demands.